Long before European settlers “discovered” the North American wilderness, the natives utilized specialized winter “snowshoes” in their pursuit of game animals. 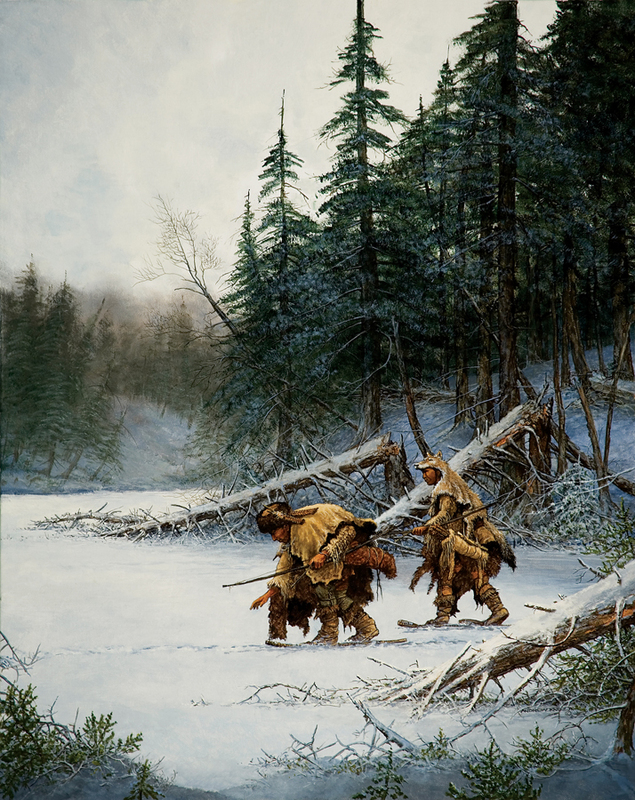 The eastern woodland, Great Lakes and even the northern Great Plains people traveled with relative ease over the surface of winter snow as their quarry quickly became exhausted while struggling through deep snow drifts and breaking through frozen streams and lakes. Although there were minor cultural design adaptations, the basic snowshoe construction remained the same for thousands of years. A light weight hickory or ash frame held together with interlaced rawhide strips provided an enhanced distribution of weight which kept the wearer from sinking into the snow. Teardrop shaped styles had an upturned toe which helped keep the snowshoe from digging into the snow and long tails which helped direct the snowshoe in a straight line. There was a style known as the “bear paw” which had no tail and the toe wasn’t upturned. This style required more of a walking stride, whereas the teardrop shape allowed for more of a gliding stride.